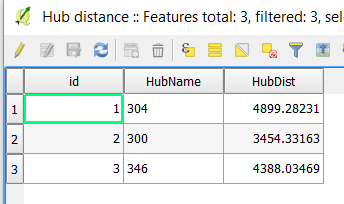 I have already tried the Distancematrix in QGIS but it seems that it can only be done between points. And I do not want to convert the lines into points. For your better understanding: The tiger:graph is the line-layer and the EVIS_Stat_Sensorik_... is the point-layer. I want to calculate the nearest line (or edge) for each point and write its id into the attribute "edgeid" of the point. Is this even possible with this function? As I am quite new to this tool, I do not really know how to debug this. Is there any other possible way to do this? 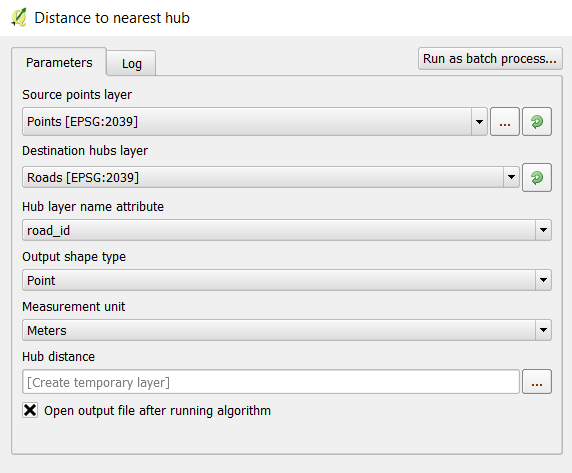 A simple solution for your question is using QGIS tool Distance to Nearest Hub. However, this tool does not bring into account your particular way of calculating distance using a 90 degree angle, as you specified. It simply measures the distance from each input point to the middle of each line feature. As with any other processing algorithms, make sure both your layers are using the same coordinate systems (in your case you had a different CRS for each input layer). If the distance field (Hub Dist) is of importance to you too (not just which feature is closest), then make sure you are also using projected coordinate systems (not 4326). First your EVIS_Stat_Sensorik and tiger layers are in different coordinate systems. GRASS does not work like that (I don't know what manipulation QGIS does behind the scenes); first convert to a uniform coordinate system. 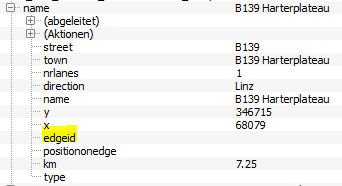 Second, I think you have reversed the column names for egdeid. The "Column name where value will be uploaded" should be edgeid, and "Column of nearest feature" should be id. one solution could be to use Attribute Transfer Plugin I didn't use it yet but it looks like it could solve your problem. 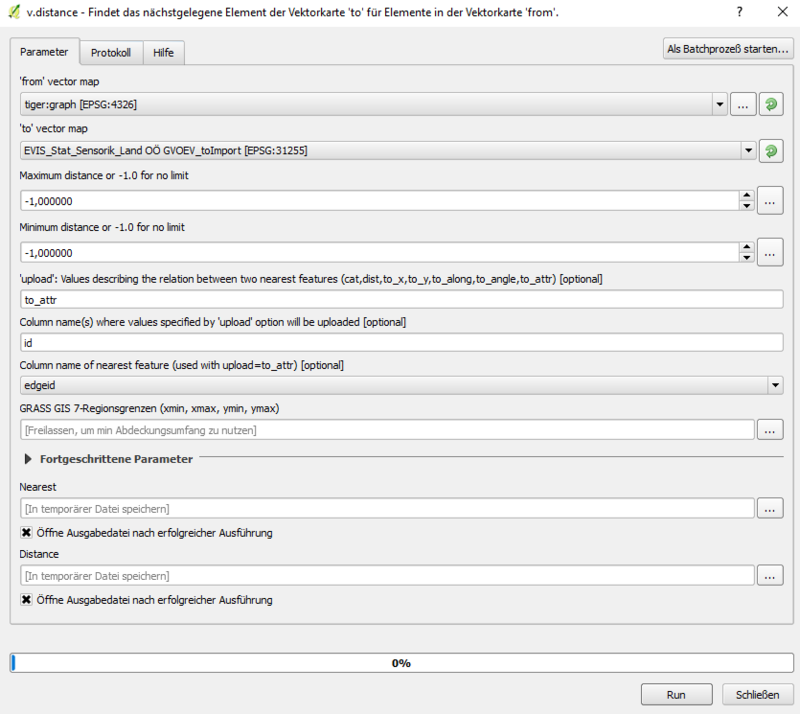 For QGIS users, the NNJoin QGIS plugin is simpler to use than the GRASS v.distance function. It will produce a new point layer with the original points and attributes plus the attributes of the nearest line and the distance to it. Not the answer you're looking for? 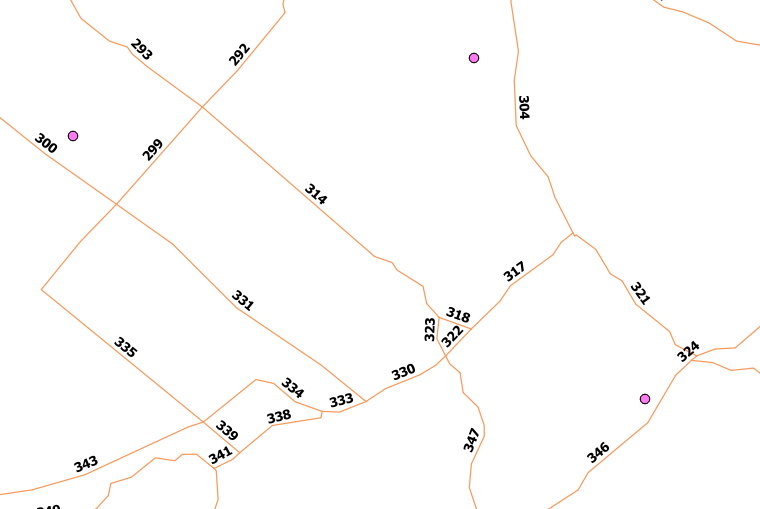 Browse other questions tagged qgis grass point line distance or ask your own question.